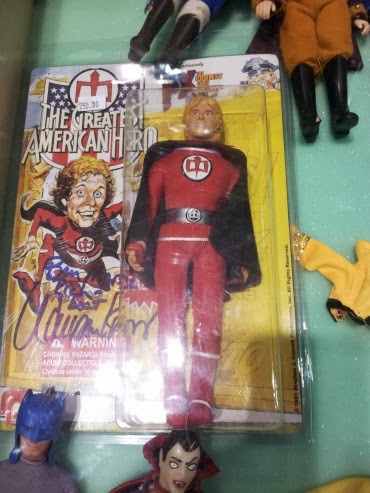 Left and Write: G is for : The Greatest American Hero! 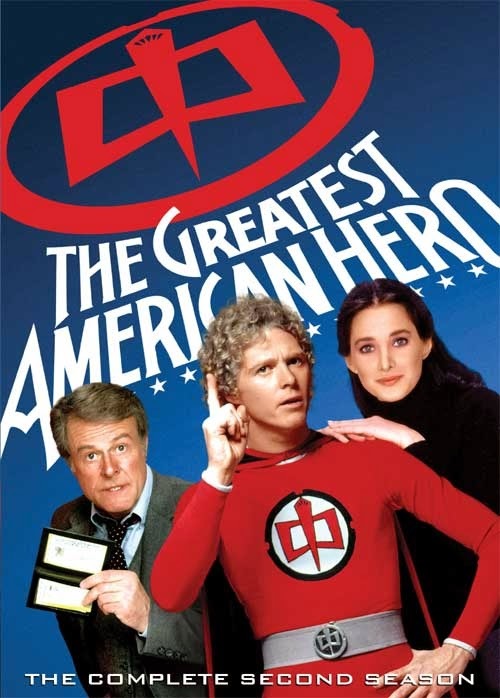 G is for : The Greatest American Hero! What happens when you mix a school teacher, a gung-ho F.B.I. agent, space aliens, and a super suit that lets its user do almost anything? Why, you get The Greatest American Hero, of course. Starring William Katt, Robert Culp, and Connie Selleca, this was another creation by the prolific Stephen J. Cannell, who also brought us The Rockford Files and The A-Team. The series centered around special education teacher Ralph Hinkley (Katt) who was chosen by aliens, from an unknown planet, to save Earth from itself. We're never told, exactly, where the aliens come from only that their world was destroyed due to environmental hazards. Ralph was given a red suit...complete with cape...and told to by the aliens (usually by them spinning car radio dials and switching stations to string pieces of the audio together into sentences) to help save the planet. The "little green guys" pair him with F.B.I Agent Bill Maxwell (Culp) in order to get some insight as to what global threats are out there. When we meet him, Ralph is going through a messy divorce but, luckily, his divorce attorney Pam Davidson (Selleca) is there for him and they're "an item". She's the only person Ralph tells of his recent acquisition from the space aliens and she's, initially, not quite sure what to make of the whole situation. She, eventually, comes to grips with it and starts helping the two out on cases as the show progresses. Ralph's "little red jammies", as Maxwell calls them, lets him do all sorts of amazing things. He can fly, run at super speed, stop bullets, is super strong, turn invisible, find information about someone by holding a belonging of theirs and, basically, whatever the script called for that week. The only thing is, Ralph's not really good at any of this....especially flying and landing......because he lost the suit's instruction manual. Yep, a suit that allows its wearer to do almost anything comes with an instruction manual. Which Ralph manages to lose....twice. Once, that night in the desert when they give him the suit the first time and another when the aliens make contact again and he asks for a replacement. They also tell him not to lose this one because they only have two. And, to compound the silliness, you have to punch numbers into the suit's instruction manual like a calculator to get it to really work as intended. Seriously? The second time Ralph loses the manual is when he tries it for the first time and shrinks down to the size of an ant. He sets the manual down on a "boulder" before growing back to normal height and the team realizes that boulder was a grain of sand. Anyway, hilarity ensues as Ralph tries to figure out how to use the suit without blowing his cover, while he and Maxwell put away Cold War Era bad guys....it was the 80s, you know. Anything Ralph manages to do with the suit, he learns by trial and error. Mainly error. I think this was one of the few shows, that I know of, where the theme song might have been more popular then the actual show. After it's initial cancellation,they tried to revive the show with a woman taking over the lead role as The Greatest American Heroine. It was never picked up and, if you've ever seen the pilot, you could see why. doing comics and still selling GAH merchandise. You're right - the song was more popular than the show. Da-da-da- da-da-da.Yep, I can still hear it in my head. I, too, was a fan of that show. Did you know that William Katt was the son of Perry Mason's secretary in real life? She was one beautiful lady. I have the series on DVD's. Thanks for the trip down memory lane. that blond, curly-haired dude was so silly! the whole show was a great example of the "innocent" optimistic 80s... miss those days! I never watched the show but still remember the song. And how it was used on Seinfeld for George's answering machine message LOL. I loved this show. I have forgotten more than I remember about it, but the flying I remember. Make that the crazy take-offs, unsteady in the air, and rocky landings. I have been known to have flying dreams and sometimes I am a pro. Other times, it eerily resembles the GAH. Oooh... Highlander. Now, you are speaking my language. I love love love that show. The Greatest American Hero was quite popular. Have heard of it. Another of my favorites. Every once in a while I will hear the song and the show is the first thing I think of. My hubs LOVES the Greatest American Hero. I bought him the first few seasons on DVD. The song brings back so many memories. I am really loving your theme Mark!! Just seeing The Great American Hero in your post, made me chuckle. I was in love with Robert Culp once. He didn't know. I remember this show. Does that make me old? I remember vividly scenes of him running and how crazy it looked. Love the show. We need more simple super heros. I remember watching the show. It was silly but entertaining. My boys loved Gargoyles. That show was just too fun! Nice to hear it's still popular in some circles. I still sing that song...all the time. It's like my personal theme song. And thanks for thinking I can't be over forty! I had the 45, but I never watched the show. 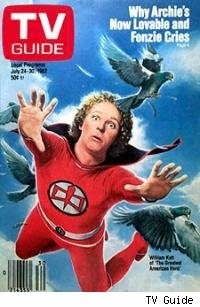 I loved Greatest American Hero. I bought the series so that my kids could see it, and they love it, too, especially my daughter. It was such a great idea; it's too bad they really didn't know where to go with it. And, yeah, I own (still) the 45 single of the song. Somewhere. I have the first three seasons or so of tomorrow's show, too. Fun fact - I was in a national tour of Sound of Music with Bill Katt. He played Rolfe. Super sweet wonderful person. A saw the title of the post and immediately started singing the song, and can not remember a lick of the actual show to save my life. I also loved Gomer Pyle and Get Smart. Such classic, quotable shows. I do remember seeing this in the UK. I recall the theme song also, I think my mum had the single or something like that. He was in Carrie wasnt he? Didnt amount to much else though. Good post. I wonder what "H" will be? Never seen the show but I get why it's a cult classic. Sounds like a different kind of show for the 80's. OMG. I actually did watch this a few times, okay, maybe more than a few! I remember the actors now more than really what they did. Cool post! I love how you dig this stuff up!